Would You Need to Extend Essay Length? Knowing how to add length to an essay can be important if you want to ensure that you meet the expectations of your tutor or professor. Typically when you are asked to write an essay or a paper you will be asked to provide one of a particular length. This length is usually set to control the amount of research that you will conduct and the depth to which you will write. If you only have to write a single page, for instance, you are not going to need to cover something as well as you would if your tutor asked for ten pages on the same subject. Submitting work that is less than the expected minimum may result in you getting significantly lower grades than what you want, and may need. So it is important that you consider ways to expand an essay so that it better meets the expectations for length. This will help you to avoid getting penalized automatically for submitting work that is obviously too short. However, care should be taken that you don’t use dubious techniques excessively just to add additional fluff to your essay without any real content. While some may be OK you should not try everything that will be listed below at the same time or you will be caught out and probably penalized even further. Find also info about interesting essay topics you may need. Create a clear outline before you even start your writing so that you have a good idea as to what sections of your essay may be lacking in substance and may need extra research and support. This allows you to better plan your actual writing and prevents you from writing an essay that is going to be too short. Do the extra research, the more information that you have to refer to then the more likely you will have enough content that is relevant. Use more than just Google when looking for information as you will be able to find far more within your library. Add a counterargument to what you have written. This provides you with not only additional word count but also shows your tutor that you are able to consider alternative views and arguments and may even boost the grade that you receive. Add more body paragraphs. A typical five-paragraph approach to writing an essay will usually expect you to come up with 3 supporting arguments within the main body. This does not have to be a hard and fast rule and there is nothing to stop you from adding an additional argument to support your thesis, or maybe even more if required. Add quotations to support your arguments more clearly; you can often use quotations or even paraphrase what your sources have said to add more weight to your own argument while also adding a significant amount to your word count. Do not use pronouns; replace them with more specific nouns. So for instance, if you were talking about “The lord of the flies” you would use the full title of the book each time you refer to it rather than “the book” and would use the full name of the author each time you mention them. Instead of “we” use all of your names. Use flowery and descriptive language by adding additional adverbs and adjectives; if not overdone this can actually really improve the way that your paper reads. Add all of those unnecessary words. We often write things to avoid the use of the, because, that, so and many others. Reword to ensure that we add back all of these words. Do not use any contractions; it’s become, it is etc. (etc. should be “for example we could use…”). Use a double space after every period to lengthen each and every sentence adding to your page length. Split longer paragraphs into two or more shorter ones; this can also make your paper easier to read. Increase the margins very slightly to help squeeze a few extra lines into being. Add an extra adjective or two to any paragraph that ends close to the right-hand margin so that you gain an extra line. An essay extender is an easy way to add in many additional words and helps you to make your paper longer with a minimal amount of work on your part. While it is not going to add any real value to your paper it will help you to gain a few extra lines at the push of a button. By simply pasting your essay into the word count extender and letting it know how much expansion you need it will give your essay a boost. This is an easy way how to increase essay length that works by adding additional modifiers to adjectives and verbs and also will replace smaller words with longer ones or even short phrases. Who Can Help Expand My Essay? Getting an essay of the right length does not have to be difficult if you use our tools or our support. Through us, you can either simply input your text within the generator or you can use our specialists to add more valuable content to your paper and gain the support that you need to boost your grades. Our professional essay writers can help you with writing your essay from scratch to ensure that your subject is fully covered to a high standard. All writing is tested for plagiarism to make sure that it is unique and we also provide you with highly effective proofreading to a high standard on all services. 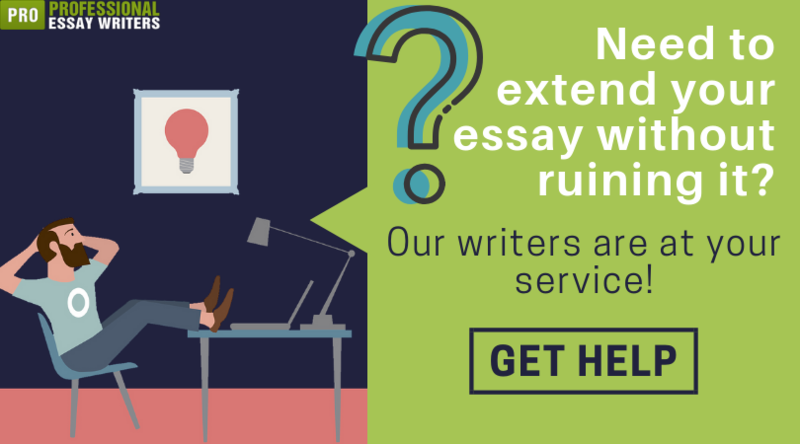 Should you be worrying about how to add length to an essay just make use of our superior and reliable services here today and ensure that you submit a paper of the right length.